The Lotte Department Store is located near Myeongdong, and is one of the luxury malls to purchase all your duty free goods. We walked to Myeongdong from Line 2, the Euljiro-1-ga Station, so the department store was along the way. Once you enter the main entrance, there are signs for a tax refund station where you can get your tax refund. There is a kiosk to get another verification receipt and a separate counter where you get the money back immediately. When I made a purchase, they told me I had the option of having the refund completely automatically, but unfortunately, I did not bring my passport with me that day, so I was unable to do it that way. They do not accept any State-government issued id cards, only passports for tax refunds. I tried the tax refund center at a later date, and was also unable to get the refund. If you are staying in Korea for only a few weeks of vacation, you can get the refund at the counter, but since I am staying for another 2 months, I have to wait until the end of the next month, closer to my departure date. However, there is the option of just getting everything done at the airport, so don't worry about rushing to get it all done immediately after each purchase. After shopping around for a bit, we stopped by a dessert cafe around the area called Sulbing (설빙). 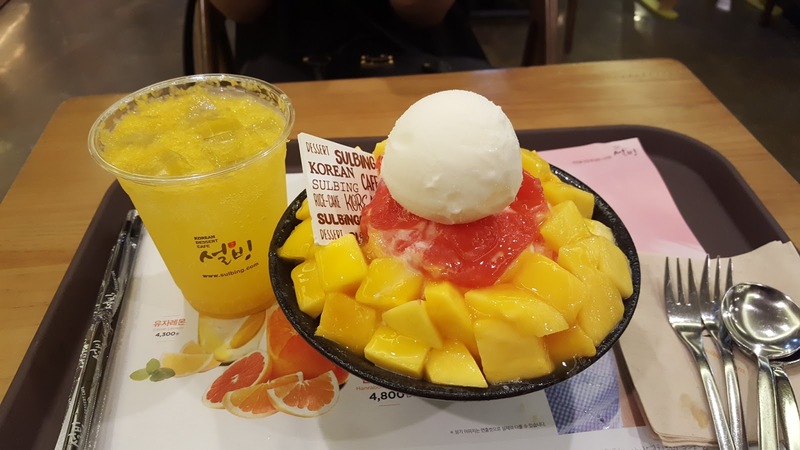 They serve a variety of traditional bingsoo with soybean powder and red bean topping, but we opted for a summer fruity version instead. We ordered the Grapefruit Mango Shaved Ice and Mango Hallabong Ade. The drink was strange. It had bits of pulp in it, but over time, the drink got worse and had a bitter orange peel taste. The shaved ice was good, but the mango chunks tasted like thawed frozen mango. The ice cream wasn't the usual vanilla ice cream that I was expecting, it was more like frozen yogurt. The shave ice itself was very light and fluffy. It reminded me of eating real snow, the way we used to stick our tongues out as a child during a snow day to catch the snowflakes.